Guitar bridges come in lots of different forms, each with its own benefits and features. Here's our guide. In the most general terms, bridges come in two types, fixed and tremelo (tremelo actually refers to the alteration in the volume of a note, vibrato is the correct term for altering the pitch. But you can blame Leo Fender for the confusion).Tremelo bridges can be split into two types, locking and non-locking. We'll deal with each type in turn. These are found on guitars which don't have a vibrato unit. The strings are anchored, either by a tailpiece or by the by itself. The Tune-o-matic bridge (in the pic above) introduced by Gibson on its Les Paul Custom in 1954 is a good example of a fixed bridge. Each string passes over an individual saddle and is usually anchored by a stop tailpiece behind - though in some cases, the strings pass through holes in the body. The Tune-o-matic allows the intonation of each string to be adjusted individually, but their height can only be adjusted as one. Other examples of fixed bridges include the Telecaster 'Ash Tray' bridge, where the strings come up through the back of the guitar's body, through the bridge, and over barrel-shaped saddles. There are only three saddles, two strings for each. So intonation is adjusted two strings at a time. The steel plate and brass saddles give a bright, twangy tone. The wraparound bridge is the simplest of all. Strings pass back through the bridge, wrap over the saddles on top and head off towards the nut. 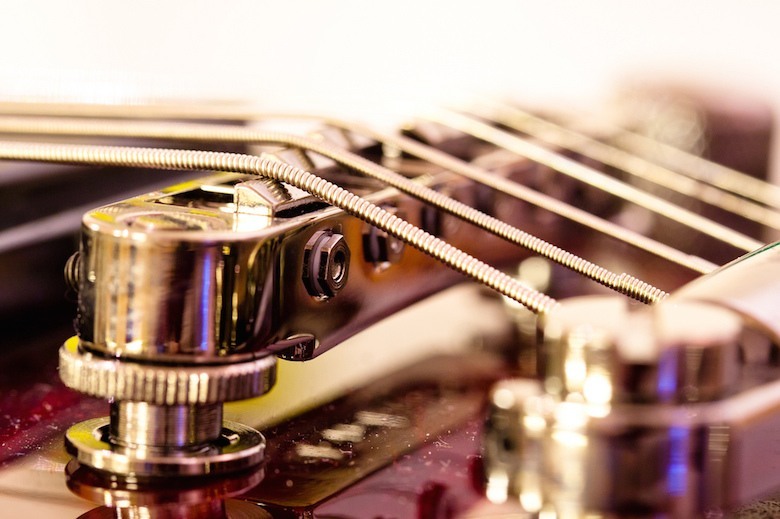 Intonation can't be adjusted at all, however, and string height needs to be adjusted for all six strings simultaneously. 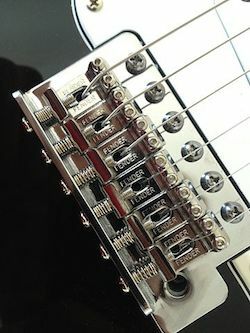 Locking tremelo bridges became hugely popular among heavy metal bands in the late Seventies and Eighties, after Floyd Rose introduced his double-locking tremelo. This bridge locks the strings at the end of the bridge, in order to stop them going out of tune. The ability of the often Stratocaster-mounted Floyd Rose tremelo to change the pitch by several tones without causing the strings to drop out of tune gave metal guitarists the freedom to make all kinds of crazy noise (We're looking at you Eddie Van Halen). 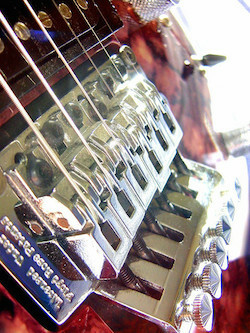 Various other locking tremolo bridges, such as those made by Trem King have appeared over the years, though the Floyd Rose remains the most widely used. Along with the wonderful Bigsby vibrato unit, the most common non-locking tremelo is Fender's synchronised tremelo. Introduced in 1954 on the Stratocaster, it was the unit that gave the world the name 'tremelo arm.' The assembly houses both the bridge and the tailpiece and is held about an eighth of an inch above the body of the guitar by a bevel on its underside on which the whole unit pivots. The strings pass over the saddles, which can be individually adjusted for height and intonation, and through the body. 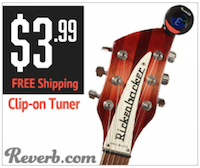 Housed in a routed out chamber on the back of the body are up to five long springs which are attached to the tailpiece and which balance the tension of the strings. The pivot action of the bridge allows the whammy bar to both increase and reduce the pitch of the notes produced by the strings. Gibson also offers non-locking vibrato units on many of its guitars, some of which feature Bigsby tailpieces.